President Fidel Castro, the Cuban octogenarian leader who has governed the country for the past 48 years, became seriously ill in July of 2006. He was provisionally substituted by his official successor, his 76-year-old brother General Raúl Castro, the Armed Forces Minister. A permanent power transfer will take place if Fidel dies. Such leadership change will not be swift or simple, given the half century of oneparty government under the elder Castro. To avoid a possible crisis, as well as to move the country toward a pluralistic system, it is imperative for the Cuban nation to undertake an in-depth look at how the political system will develop. Changes have surely been occurring for the past 25 years. The Cuba this analyst left during the Mariel Boatlift, in May of 1980, is in many ways very different from today’s Cuba. For example, at the time there were no dissidents walking the streets of Havana, or receiving international awards abroad, or giving interviews to foreign radio stations, or receiving invitations from foreign diplomats. In the economic front, no form of private enterprise was allowed; not even a simple shoe-shiner, let alone today’s partially foreign-owned tourist industry, with over two million visitors per year, including many small private enterprises such as paladares and guest houses, and entrepreneurs such as taxi drivers, guides, artists, craftsmen, and even prostitutes that live from such tourism. However, there is need for further changes. Cuba needs a transition to a freer society, one sincerely inclusive—and not only tolerant of the above-mentioned activities for political and economic reasons. Cuba requires a pluralistic society, one that permanently incorporates differences in thought, and independent economic activity, instead of just allowing these on a temporary basis. And Cuba needs all these changes implemented without dramatic events that may endanger its citizens, or its material progress. We read how “the regime had aged; the President was 80 years old and the average age of the cabinet was 67” (Nueva Historia, 2007). The above citation, which is applicable to Cuba today, refers to General Porfirio Díaz, president of Mexico in 1910. After his demise, the country entered a period of civil wars and revolutions that lasted 20 years. This disaster is what Cuba must avoid. To help prepare conditions that favor a peaceful transition in Cuba, we need to have a better understanding of the underlying problem. We approach this task following the best traditions of Cuba’s great 19th century statesman, José Antonio Saco. This great Cuban strived, since the 1820s until his death in the 1870s, for Cuba to attain autonomy from Spain similar to that of Canada, and to negotiate the end of slave trade and then of slavery. Such is the model used for this paper, as well as for my research work throughout all of our time in Exile. My professional background is in industrial and systems engineering, a field well-known for its studies to improve and/or optimize organizations. One of the modern tools in use for achieving process and organization improvement is the Six Sigma methodology (“Six Sigma,” 2007). It was initially successfully used to solve industrial problems (Pande and Holpp, 2001), and more recently health, government, and education ones. 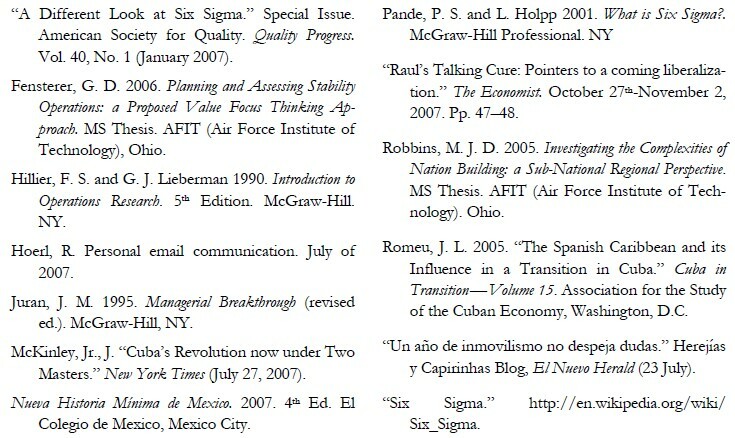 In this paper the Six Sigma methodology is used in a “quite unique” application, the systematic study of the problem of a peaceful transition in Cuba (Hoerl, 2007). In the rest of the paper we briefly overview Six Sigma and then apply its first two phases (Define and Measure) to analyze the problem of a Cuban transition. We believe that, at the current stage of the problem and with the information available, such two phases are the only ones that can feasibly be implemented with some real basis. 4. Establishment of Effective Government (associations, unions, political parties). These conditions should pursue, especially in the Cuban case, the establishment of a permanent, stable, independent and neutral political system; one that will pose no more, any security or international problem to the United States, as it occurred during the Cold War due to its alignment with the Soviet Union. An example illustrates this issue. In the past, some U.S. administrations fostered “friendly” regimes in several neighboring countries. For example, in 1952 Cuba had a young, growing democracy, and an election coming. The two front-running nationalistic, but democratic, presidential candidates were Carlos Hevia and Roberto Agramonte. The third and weakest candidate, General Fulgencio Batista, was considered a friend of the United States. He carried out a coup, taking over the country and receiving the recognition of the American government. The long-term result of supporting General Batista over the established democratic process was the creation of political conditions that generated revolution against Batista’s regime and the establishment of a 50–year-old, one-party dictatorship, which brought the mentioned military and political problems. We contrast such decision with the American support for the democratic regime created by President José Figueres in Costa Rica. Figueres’ regime was fairly independent in international terms, but remained a stable, strong member of the Organization of American States and the Western World. We posit that the U.S. currently faces a similar decision regarding Cuba. For, either the U.S. supports a paced, phased transition to a pluralistic system in Cuba, or it risks that such a transition does not take place at all, leaving open Cuba’s future development as well as the nature of its relations with the United States. Systems engineering analyzes an entity, its parameters, its constraints, and objectives, through operating conditions such as system bottlenecks and flows. It uses engineering tools and math to optimize (find the most efficient setting of) the entire operation (Hillier and Lieberman, 1990). Quality Engineering looks at a system’s operation via its inputs and outputs. It tackles its sporadic problems, which occur intermittently and randomly, and fixes them by restoring the status quo. It also identifies and fixes its chronic problems, which are long term and permanent, by Changing the Status Quo. It does this by implementing four processes: Quality Assessment, which analyzes current status of the system; Quality Planning, which identifies issues for system improvement; Quality Improvement, which implements the improvements defined; and Quality Control, which assesses the system improvements and its steady-state implementations. The Six Sigma methodology was first implemented in Motorola in the 1980s. Subsequently, it was successfully extended by Hahn and Hoerl to GE, in the 1990s. The methodology is composed of five phases: Design, Measure, Analyze, Improve and Control, and is better known by its acronym: DMAIC (Juran, 1995). 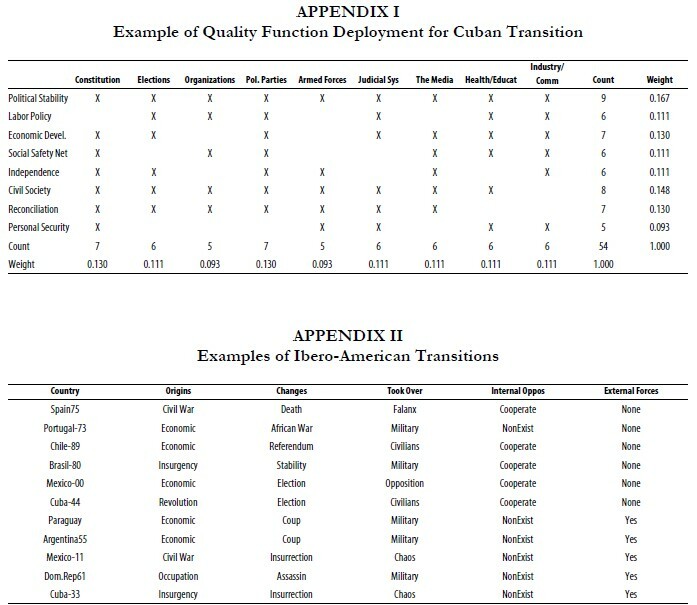 When applying this methodology, one must start by defining and/or identifying what is (1) the entity of interest (in this application, the Cuban government and its opposition); (2) what is the process to be modified (a transition to a pluralistic system); and (3) who is the ultimate customer who will benefit from the improvements obtained (the Cuban nation). In the rest of this paper, the first two phases of the Six Sigma methodology (i.e., Define and Measure) are implemented, using some of the above-mentioned Quality Engineering tools. The remaining Six Sigma phases, which comprise future work, are then overviewed. This is the first step in Six Sigma methodology. In it, we identify and define what is the real problem (Transition), root causes, key ingredients, whether there are reference cases, how have they appeared, their characteristics, what has been done right or wrong in previous similar cases, and what have they achieved. Specifically for the Cuban transition case, one wants to know and/or define the transition mission and objectives; why a transition is needed; and compare the cost of moving forward versus lack of change (remaining the same). Finally, one wants to know what impacts will the transition have on Cuba’s different strategic partners (i.e., countries such as the United States, the European Union, Latin America, etc.) or on different system elements (the elderly, infants, and other vulnerable strata of the general population). One also wants to define the project team, including its composition (who participates) and functions (doing what); define the project components (what gets done and when) and its support team (who collaborates) and functions (and how); establish the operational definitions (working procedures); define appropriate Performance Measures (PM); and define the cost of poor quality (how expensive is doing nothing, as opposed to change). To identify key transition characteristics, we benchmarked past successful and unsuccessful twentiethcentury transitions from long-lasting, authoritarian, personal regimes (i.e., tyrants in the Greek sense), where a strong man was backed by an organized military- political party machine, in several Ibero-American countries: Chile, Cuba, Brazil, Argentina, Spain, Portugal, Mexico, Venezuela, Paraguay, Central America, and the Dominican Republic. A transition is assessed as a success by analyzing the type of regime that followed it (i.e., if eventually it stabilized as a pluralistic, open regime). Ibero-American countries have been considered because of their resemblance with Cuba (i.e., a strongman, backed by a strong political-military machine). Two exceptions are the Mexican (PRI) and Salvadorian authoritarian regimes, where the political-military machine created a succession mechanism, which periodically replaced the strong-man (i.e., President) but not the system itself. We did not consider the transitions from the former communist, Eastern European regimes because key conditions differed from those in Cuba. First, their regimes were imposed (and later controlled) from abroad (by the former Soviet Union) after World War II. Second, their transitions were due to the disappearance of such outside force, and not to the disappearance of the strong men that governed them. And third, we consider that many of these transitions have not been very successful, as the regimes that followed them are far from democratic (e.g., Byelorussia, Russia, Ukraine, Rumania, Slovakia, the Central Asian Republics), with clear exceptions represented by Hungary, Poland, the Czech Republic, and the Baltic nations. Perhaps such transitions ran into problems because their regime changes also included big changes in economic system (which will also be the case in Cuba). Hence, lessons from these other transitions should emphasize what not to do, and mostly concern economic, rather than political changes. Finally, and for the sake of completeness, other well-known political transitions from autocratic regimes in other parts of the world, are also considered. • Spain, after Franco’s death, in 1975. • Portugal, after Salazar-Caetano, in 1973. • Chile, after Pinochet’s retirement, in 1989. • Brazil, after the generals’ retirement, in 1980. • Venezuela, after General Juan V. Gómez’ death, in 1936. • Brazil, after President Getulio Vargas’ two terms, in 1945 and 1954. • Argentina, after General Perón’s two terms, in 1955 and 1973. • Argentina, after the military dictatorship and the Malvinas war, in 1985. • Mexico, after General Porfirio Díaz’ exodus, in 1911. • Dominican Republic, after Rafael L. Trujillo’s death, in 1961. • Nicaragua, after the Somoza dynasty was overthrown, in 1979. • Nicaragua, after the Sandinistas lost the elections, in 1990. • Honduras, after General Carias Andino was deposed, in 1954. • Guatemala, after General Jorge Ubico was deposed in 1944. • El Salvador, after the military regime lost control, in 1979. • Haiti, after the Duvalier dynasty was overthrown,, in 1986. • Cuba, after President Machado and the revolution of 1933. • Cuba, after General Batista’s two exodus, in 1944 and 1959. • Turkey, after Kamal Ataturk’s death, in 1938. • China, after the death of Mao Tse Tung, in 1976. • Soviet Union, after Stalin’s death, in 1953. • Soviet Union, after the Brezhnev gerontocracy, in 1985. • Vietnam, after the death of Ho Chi Minh, in 1969. • North Korea, after the death of Kim Il Sung, in 1994. Such conditions must exist for a successful Cuban transition to take place. It is as much a historical responsibility for the Cuban government to allow such conditions to develop as it is also for the opposition to have the talent to contribute to build them. This is the second step of Six Sigma. It was Lord Kelvin who said that one does not really know much about an entity that one cannot measure. Hence, identifying and establishing good measurement variables and units is key to assess progress and foster movement. Several tools and activities contribute greatly to the establishment of good Baseline PM that, in turn, contribute to implement an adequate measurement system. They include: Cause-effect diagrams (fishbone), Pareto charts and Checklists; Flowchart and process diagrams; Brainstorming; and Affinity Analyses. With these activities one can plan and implement an effective data collection effort. This, in turn yields the measurements that Process Capability and Six Sigma procedures require, to assess the process. Specific examples of activities of this phase include defining clear measurement systems to assess process objectives. In addition, detailed quantitative descriptions of the current state of affairs (e.g., production, consumption, socio-political, healthcare and education indices), for use as base line PM, are required. They serve to implement before and after comparisons and to measure process improvement. Some examples of these methods, in a transition context, are given in the Appendix. A detailed Transition Process Failure Mode and Effect Analysis (FMEA), describing what can fail, how, by what cause, and with what consequences, is required. Also, cause-and-effect (Ishikawa) diagrams, describing how key factors impact transition goals, are needed. Pareto charts, showing factor relative importance, are also necessary. All PM proposed to assess transition success and progress should also include the reasons for their selection, as well as comparisons of present and projected values. See examples of FMEAs, Ishikawa and Pareto charts in the Appendices IV through VI. • Clubs, unions, political associations, etc. • Civic and fraternal organizations, etc. • Membership attendance to clubs, churches, libraries, lodges, etc. • Number of remaining political prisoners and exiles. Six Sigma and Quality Engineering methodologies also utilize QFD or Quality Function Deployment (also known as “House of Quality” or “the voice of the customer” who, in this case, is the Cuban Nation). QFD helps identify the “whats” (the customer desires). It also helps identify the “hows” (possible technical implementations). QFD also assesses the association between problem variables, as well as provides measures (or ratings) for their relative importance. The remaining phases—Analyze, Improve and Control —cannot be specified at this time. The Cuban transition process has barely started. The new administration, however, has started introducing minor changes and implementing some new policies. For example, on the political front, Raúl Castro denounced corruption and introduced some measures to fight it, removing several cabinet ministers (“Raúl talking,” 2007). On the economic front, General Castro allowed the importation of consumer products such as televisions and video disc players, has told the police to let pirate taxis operate without interference, has pledged to spend millions to refurbish tourist hotels, marinas and golf courses, has ordered one of the state newspapers to investigate the poor quality of service at state-controlled bakeries and other stores (McKinley, 2007). Perhaps General Castro’s most important step, so far, has been to pay the debts the state owed to private farmers and to raise the prices the state pays for milk and meat (“Un Año de Inmovilismo,” 2007). It is still too early, however, to see whether the mentioned changes are substantive and sustained, or just cosmetic, and to assess how the Cuban opposition and other key players react to them. To assess such changes, and for the sake of completion, we offer an overview of the tasks required in each of the three remaining Six Sigma phases, providing implementation examples within the transition context. The Analyze Phase includes developing the data collection plan, the list of theories or hypotheses, the power and sample size required for testing them and the implementation of such hypothesis tests. In addition, the derivation of correlation and regression models, as well as models for analyses of variance (ANOVAs) and Design of Experiments (DoE) using the data collected in previous phases. Specific examples of the above include building lists of factors to be assessed, analysis of root causes for failures and problems, and the estimations of transition factor impacts, both on the Cuban population as well as on the main countries affected by it. The Improve Phase includes developing creative (e.g., thinking “outside the box”) problem solutions and benchmarking them (comparing them to those implemented by the above-mentioned transitions). This will help strengthen the implementation of the Improvement strategies proposed. The transition needs to consider several strategies and their associated costs and impacts, so that these may be compared, traded-off, so that the final, preferred and most efficient strategy (or combination thereof) is identified. Strategy quantification enables the creation of a sorted list of preferred courses of action and their respective impacts. Such impacts include the direct, indirect and collateral costs of implementing the different strategies, and their socioeconomic and political impacts. Such costs allow defining countermeasures to help reduce negative impacts arising from some transition decisions (e.g., the effect of higher prices on retirees). A pilot plan with plausible results can then be constructed, including a working calendar. The Control Phase includes the implementation of a process control plan, listing its required procedures, training and support, as well as the measurement and test plans to assess the improvements. Also needed are strategies for transition stabilization, leading to the establishment of a permanent (political and economic) pluralistic society. Finally, the transition project final report, assessing its results, to verify that the proposed changes worked as intended, should also include a list of lessons learned. These should document the main problems occurred, their consequences, and their solutions. This research constitutes a “work in progress,” to be continued as events unfold and more information becomes available It is imperative to establish appropriate initial conditions, in order for a transition to take place (or take off) at all. Then, as the transition develops, additional and more detailed specifications will be defined. There are many potential obstacles to surmount. One is the widespread belief that no one from within the Cuban government would be interested in having one. But history has proven such belief to be radically wrong. In many countries, high-ranking officers from the government have helped develop a peaceful transition, given the proper conditions, and I believe Cuba will not be an exception. On the one hand, Spain exemplifies a successful transition started by General Arias Navarro, Franco’s head of the government, who permitted it, and pursued by Adolfo Suárez and Manuel Fraga, two of Franco’s important Falangist ministers, who pursued it. On the other hand, during the Mexican revolution of 1911, an example of failed transition, one finds three distinct groups within General Díaz’ government: (1) the traditionalists (Baranda); (2) the technocrats (Limantour); and (3) the reformists (Reyes). Had they been heard by General Díaz, and had they arranged a transition with the opposition (Madero), Mexico might have avoided 20 years of civil wars and destruction that the ensuing revolution brought to the country. The fact that people cannot act freely in Cuba at this time, even within government ranks (remember the trial of General Arnaldo Ochoa and other Cuban officers in 1989), does not mean such people do not exist. The passing of President Fidel Castro may provide the real possibility of such outings to occur, if the right conditions are created. The key issue is that a set of minimal conditions must be created. These should include the organization of a broad-based, cooperating, internal opposition, and the start of an open-minded dialogue between the different sectors of the Cuban Nation, under the guidance of an “Arbiter.” Such minimal conditions do not exist at this time. And every effort to create them should be prioritized, both by the Cuban government and by the opposition, if a transition is to occur. A specific need for a Cuban transition to take place, given its geographical and historical context, is the presence of an Arbiter. There is large, mutual distrust among the Cuban government, the opposition, and other external elements of this problem. An Arbiter will provide the necessary assurances, to all parts, regarding personal safety and process continuity, two main issues to consider. Such a proposal is consistent with our past writings in this area (Romeu, 2005), and does not contradict our previously mentioned research results regarding that foreign intervention hinders, rather than helps, the realization of a transition. History has shown how most successful Ibero- American transitions have occurred without intervention from abroad. However, “Intervention” is very different from our proposed “Arbitration”. Intervention implies an active, unwelcome pressure from the outside. Arbitration means facilitation by mutual consent, from some mutually accepted third party. An example will illustrate this point. During the civil wars in Nicaragua and El Salvador, in the 1980s, Cuba actively supported one side, while the U.S. actively supported the other. Neither could have acted as a mutually trusted and accepted Arbiter in these conflicts. However, the Contadora group of nations was a very successful Arbiter and facilitated the peace in Central America, which would perhaps not been achieved otherwise. The U.S. has had a long conflict with the present Cuban government and has actively supported the Cuban internal and external opposition. Hence, the U.S. has become part of the argument and cannot function as an Arbiter. A U.S. intervention in the transition process, no matter how well-intentioned, would provide unnecessary excuses to those individuals and organizations actually unwilling to pursue such track, thereby diminishing the real possibilities of a transition to take place at all. The Arbiter, in the Cuban case, should be a nation or group of nations that have not had controversial participation in the past fifty years of US-Cuban controversy. For example, countries from the European Union (e.g., Spain, France, Portugal) or from Latin America (Mexico, Costa Rica, Chile, Brazil), or better yet, from both regions, could provide such Arbiter function. For the three remaining sides, Cuban government, Cuban opposition and the U.S. (the fourth, former Soviet Union, is no more), would eventually trust them and accept their decisions in the long and difficult transition process. A Cuban transition, based on research about Cuban history and successful political transitions in Ibero- America, highlights the following points: (1) successful transitions have evolved from the inside, as in the case of Spain and Chile; (2) foreign pressures have proven negative, as illustrated in the failed cases of Haiti, the Dominican Republic, and Cuba in 1933; (3) cooperation between sectors is a must, as illustrated in the successful cases of Spain, Chile, Brazil in 1980, and Portugal; (4) national reconciliation is absolutely required, as illustrated in the cases of Chile, Brazil, Spain, and Portugal; (5) assurance for all parts requires an Arbiter, as occurred with ending the civil wars in Central America and the Contadora Group’s participation; (6) but these Arbiters should be independent and non-partisan, and possibly from Europe and Latin America; ones that can act in good faith and be accepted by all parts in conflict. 1. Many friends and colleagues, in ASCE, ASA, and elsewhere, have contributed to my research throughout the years. They are too numerous to be mentioned here, and I do not want to risk omitting anyone. All are highly appreciated, in particular the excellent comments of the paper’s discussant, Dr. Alfred Cuzán of West Florida University, and the careful editing of Drs. Joseph Scarpaci and Jorge Pérez-López.